You have a big job ahead of you. You are looking for a wedding photographer or family photographer. I could rattle on about my awards and my proven work...but I won't. What really matters to you and your family? Providing ‘good photos’ is an understatement of my services. I am unique because of the vision, consistency and experience I bring to my craft. It does not matter the weather --rain, bitterly freezing temperatures, or noon-day sun; if the electricity goes out; if the dress arrives 3 hours late; the unpredictable mood of the Mother of the Bride, I will know how to handle the situation with poise and style. I know how to handle the church that is as dark as a tomb and the Priest who tells me I cannot move around during the ceremony – and still get amazing pictures. I know to watch for mom’s crooked glasses, how to handle the hecklers standing behind me, how to deal with a drunk bridal party without ruining their fun, how to handle the parents of the groom who got divorced 20 years ago and still can’t stand to be in the same room, how to make sure the bride and groom have a good time (even having energetic fun!) during pictures so they have a wonderful memory of the day, all the while creating award-winning and timeless imagery. 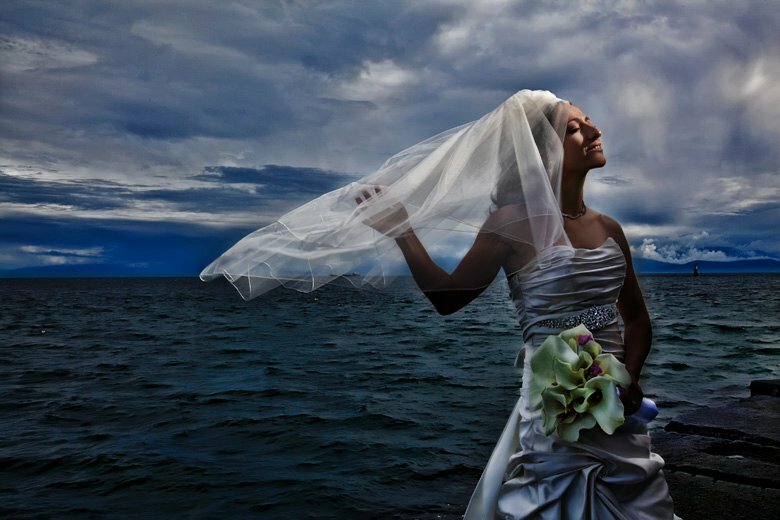 If there is a freak summer snowstorm, or the bride wants to run to 7-11 for a slurpee during photos, or the wedding occurs at night or in the dead-low-light of winter, I know how to capture these images creatively where the pictures will be better than they remember it. I know to look for and create the tender moments that connect the wedding-day journey to the relationship – the body language of a heart swelling, the language of never wanting to let go, the look a groom has when he knows their unborn children will have her eyes, the kiss when no one is watching, the excited expression when they know that after this kiss they will be bound to their heart’s best friend for the rest of their lives. I really care about my clients and I connect and communicate well with them and their families. Their wedding and portrait experience is vitally important to me. Many of my clients feel like family to me. Along with the experience I provide, I add a unique and masterful dimensionality of creativity, imagination, energy, vision and soul to my images, in a style that only I can supply. With my women and teens imagery, I know how to pose and light for any body shape. I know how to highlight favorite body parts, while minimizing less-favorite without it looking obvious. I can show everyone that they are beautiful and desirable, no matter if they are a size six or a size sixteen. I can show them these images on the back of my camera – without needing to “fix” it in Photoshop to reaffirm to them the reality of how beautiful they are. I know how different she will feel from that moment on. Those are the reasons why people hire me.